The number of measles cases worldwide nearly quadrupled in the first quarter of 2019 to 112,163 compared to the same period last year, the World Health Organization (WHO) said Monday, citing provisional data. Higher rates of the preventable but highly contagious disease, which can kill children or leave them disabled for life, have been recorded in all regions, the United Nations agency said in a statement, appealing for better vaccination coverage. "Over recent months, spikes in case numbers have also occurred in countries with high overall vaccination coverage, including the United States … as well as Israel, Thailand and Tunisia, as the disease has spread fast among clusters of unvaccinated people," the WHO said in the report. Fresh outbreaks have hit the Congo, Ethiopia, Georgia, Kazakhstan, Kyrgyzstan, Madagascar, Myanmar, the Philippines, Sudan, Thailand and Ukraine, "causing many deaths — mostly among young children," the WHO said. Meanwhile, the number of confirmed cases of measles in the United States this year jumped by nearly 20 per cent in the week ended April 11 in the country's second-worst outbreak in nearly two decades, federal health officials reported Monday. Increasing vaccination coverage maximizes a population's protection, the WHO said. Global coverage with the first dose has "stalled" at 85 per cent, against 95 per cent needed to prevent outbreaks, while 25 countries still do not include a second dose in their national programs, it said. A growing and vocal fringe of parents in the U.S. oppose measles vaccines believing, contrary to scientific evidence, that ingredients in the vaccines can cause autism or other disorders. The U.S. declared that measles had been eliminated from the country in 2000, meaning the virus is no longer present year-round. But outbreaks still happen each year, typically when unvaccinated people travel to the country from parts of the world where the disease is still common. After a large spike in 2014, the number of cases over the following three years averaged out to 130 cases, with a jump to a provisional total of 372 for 2018. 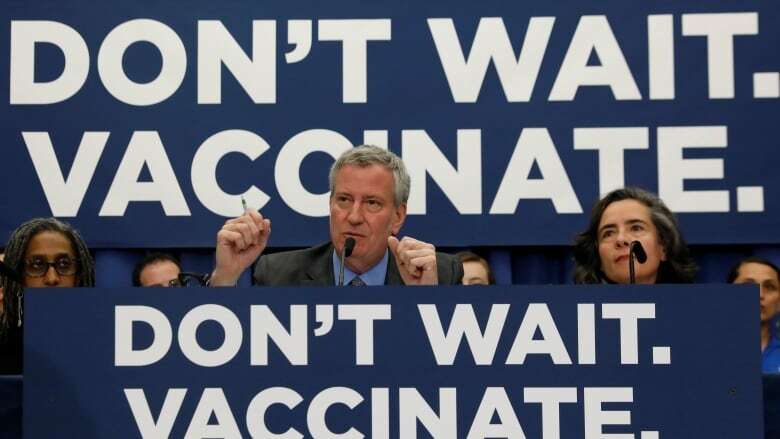 New York City alone has recorded at least 285 cases of measles since October, according to local health officials, the large majority among members of the Orthodox Jewish communities in Brooklyn. In Canada, 33 cases of measles have been reported as of March 30, with incidence in Quebec, British Columbia, the Northwest Territories, Ontario and Alberta. The Public Health Agency of Canada tracked 29 cases for all of 2018.